One of the many legacies of the REACH program is the development of Community Health Worker (CHW) training by The Wellness Coalition (TWC) and the widespread adoption by many River Region nonprofit organizations of the skills and strategies shared in that training. As REACH partners, 15 non-profit organizations used CHW training to meet the goal of increased healthcare access for the people that they serve. Now, their clients who may be at risk for chronic diseases, have the advantage of contact with case managers who are aware of healthcare resources and ways of managing or preventing chronic conditions. Even though these nonprofit organizations have differing mission statements, they have all taken a stand to institutionalize health within their services. As a CHW network, this broad coalition of organizations is positioned to have a long-term impact on improved community-clinical linkages in the River Region. Community-clinical linkages are connections between different workforce sectors that improve population health. When community sectors, such as local non-profits, know how to work in tandem with the resources of the healthcare arena, the people served by both sectors have improved opportunities to be and feel healthy. Inspired by CHWs as an evidence-based workforce strategy to reduce health disparities, TWC designed a course of training for CHWs and enlisted nonprofit organizations located within targeted REACH census tracts to incorporate CHW services into their ongoing efforts as a way of broadening the community response to health disparities. Once trained as CHWs, case managers for these organizations began including questions concerning client health and client access to healthcare resources into client profiles. 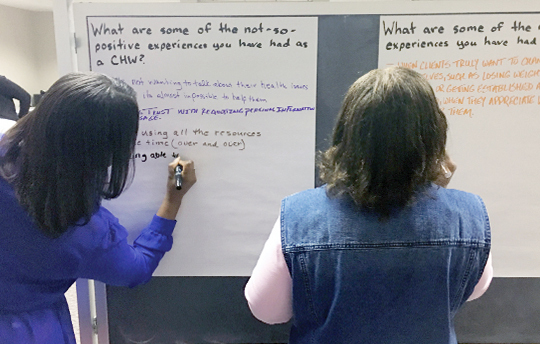 If healthcare needs were raised by their clients, CHW-trained case managers addressed those needs with information on available assistance and direction on how to access resources and make lifestyle changes. After a time, the case managers followed up on the healthcare needs of their clients to determine what subsequent assistance might be needed. Many of the nonprofits found that their clients’ healthcare goals or issues were intertwined with other needs, like maintaining a job or strengthening familial relationships. For these agencies, this was confirmation of the importance of CHW skills and services. At least two nonprofit organizations in the group of REACH partners were so affected by the healthcare needs among the population they served that they began offering financial aid for medication assistance. CHWs from each REACH partner organization met monthly with TWC staff over the course of a year to discuss the challenges and successes of CHW services. They also collected data on their efforts in order to evaluate the impact of their work. Even though the CHWs are no longer sharing data with TWC, most of the organizations that they represent continue to incorporate CHW services, and they still work with TWC as members of a healthcare access coalition. TWC offers periodic refresher training and networking opportunities for the CHWs, providing the group with updated information on healthcare resources and best practices for incorporating CHW services into case management. Along with the positive results that have been measured within the case management work of these CHWs, constructive feedback from CHW networking sessions has been affirming for TWC, and it inspires efforts to sustain their capabilities and their potential impact on population health. 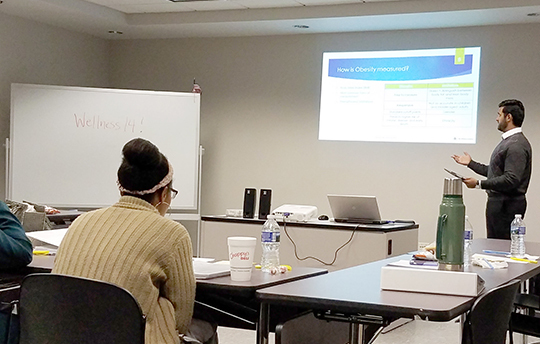 In June of this year, TWC invited the CHW network to a presentation on nutrition by Dr. Evelyn Crayton, an esteemed healthcare professional and experienced teacher. While primarily presenting information on diabetic nutrition, Dr. Crayton debunked several myths of well known diets, addressed portion control and caloric intake, and provided examples from her personal health journey. She gave a well-received talk, drawing from her experience with clients and sharing the importance of being culturally and linguistically relevant in the delivery of health information. She reminded all that, across sectors, providing services in ways appropriate to the needs of one’s clients is an important aspect of advancing equity. TWC looks forward to providing the CHW network with further opportunities to stay abreast of health information and resources, as well as ways of mindfully sharing it according to client capabilities. REACH allowed TWC to broaden the field of organizations in the River Region that are taking a stand against health disparities. Not only did they meet REACH goals during the parameters of a community action plan that lasted from 2015 to 2018, but the CHW network of nonprofit organizations also continues to weave health awareness and healthcare access opportunities into its services for those in the River Region who are living with challenges to their health. There is much work to do and room for more organizational partners in a coalition to advance health equity. TWC looks forward to the continued expansion of the CHW network and welcomes inquiries from nonprofit organizations concerning its CHW training. For more information about TWC’s CHW training, check out the short video on the TWC website at thewellnesscoalition.org/community.